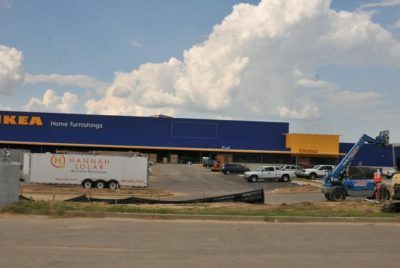 Mid-South shoppers can now breathe a sigh of relief – Memphis Ikea has announced an opening date. The Global Swedish retailer will open its new 271,000-square-foot store on a 35-acre parcel near Interstate 40 and Germantown Parkway Wednesday, Dec. 14 at 9 a.m.
“We are thrilled by the excellent construction progress made to date, and believe we can complete the remaining milestones and interior build-out by mid-December,” said Trisha Bevering, store manager for Ikea Memphis, in a release. Besides home goods and furniture, the store will also have a children’s play area, 250-seat restaurant, an 800-space parking lot and the largest rooftop solar array system in Tennessee. More than 500 jobs were created during construction and roughly 225 jobs will be created once the store opens. Memphis-based Linkous Construction was the general contractor on the development. Ikea Memphis will mark store No. 43 in the U.S. for the retailer. In total, there are more than 380 Ikea stores across 48 countries. Customers can start lining up two days prior to the Memphis store’s opening on Monday, Dec. 12.